The manufacturing sector is facing a more complex situation. With volatility in the petrochemical markets, economic and political events, you need to have visibility and better understanding of what drives your chemical raw materials prices. ICIS pricing data is the go-to resource for informing contract price settlements. 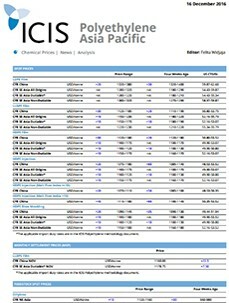 Our chemical commodity price assessments have been trusted by buyers and sellers around the globe for over 30 years. Combined with our analytical solutions such as 12-month rolling price forecasts and supply and demand data, you can capitalise on market changes to optimise your purchasing strategies and profit margins.